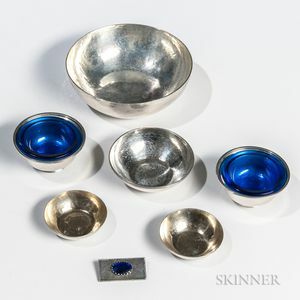 Seven Arts and Crafts Sterling Silver Items, Massachusetts, early 20th century, five Franklin Porter: three small bowls, a larger bowl, and a brooch; and a pair of salt cellars with cobalt liners by Frederick J.R. Gyllenberg, approx. 10.5 troy oz. total (not including glass liners).